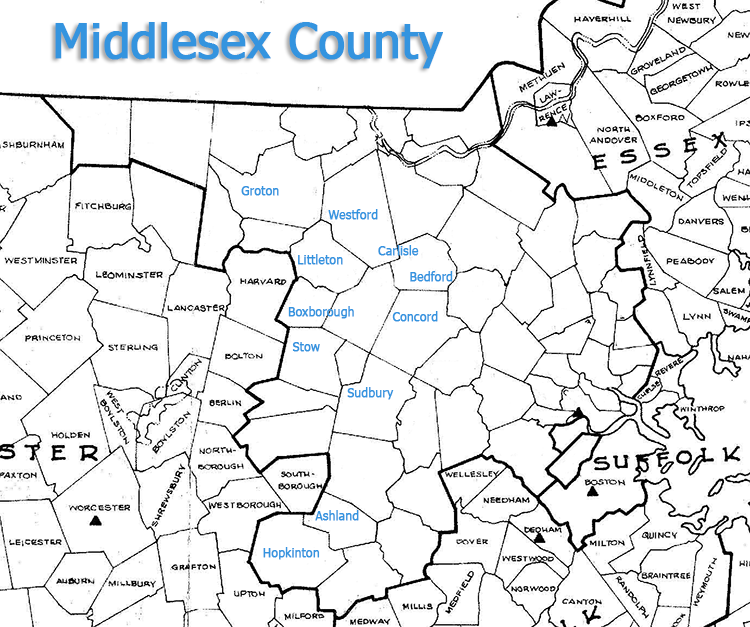 Middlesex County has some very distinct zones where particular water quality is of concern. For example, Harvard, MA has a fairly broad area where there is a high susceptibility to Arsenic in water and Radon in water requiring water filtration. Carlisle has some areas of radon concentration as well as Iron and Manganese in water which require a water softener, reverse osmosis and/or other water filtration equipment. Also, Carlisle has no public water supply and all private wells, many of which require a water softener or other type of water filtration system. You can go to http://www.carlislema.gov/pages/CarlisleMA_Health/indivwater for more information on water in Carlisle. Sudbury town water is supplied from approximately 11 different sources (surface water supplies and wells). as a result, wide inconsistencies in Sudbury water quality may be experienced throughout the year depending on the primary source being pulled from. This may complicate the determination of what type of water softener or water filtration system is most appropriate. Hopkinton has high Iron, Manganese and low pH in many of it’s private wells, as does Stow (The Boston Marathon starts in Hopkinton on route 135) . For more information from the Hopkinton Water Department, see the following link at Hopkinton Dept Public Works-Water. There is no public water supply in Stow, only private wells or community water supplies sourced from wells. There used to be a public water supply for some parts of Stow, but this was ended when the supplier filed for bankruptcy in 2010, forcing Stow residents previously serviced to dig their own private wells. Many of the homes in Stow require some type of water filtration, reverse osmosis or water softener system for either health related or aesthetic water quality issues. Groton, Dunstable, Ashland and many other towns in the county also experience high Iron, Manganese and low pH. Remediation of these problems can be achieved with water softeners, pH neutralization, arsenic specific resin for the removal of arsenic from well water, systems to remove radon from well water and other water filtration systems, including reverse osmosis purification. Some of the common water quality issues found in other towns within Middlesex County also include Hard water, Arsenic in water, Radon in water, High Iron, Manganese and Low pH. Have your water supply tested for contaminants by contacting a H2O Care treatment professional. If it is a health threat-related contaminant such as Arsenic or Radon, we can help you prepare a proper sample to send to a state certified laboratory and assist in interpreting the results. For basic water testing for pH, Iron, Manganese, Hardness or Total Dissolved Solids, we offer complimentary water tests to Bristol, Essex, Middlesex, Suffolk, Norfolk, Worcester and Plymouth counties.